JFH News: Family Force 5 Gives Away Brand New Song For Valentine's Day! Family Force 5 Gives Away Brand New Song For Valentine's Day! It was quietly mentioned by the Word Entertainment label recently that Family Force 5 was releasing a new single titled "Hold Your Hand" Valentine's Day week, but who knew they'd give it away for FREE? The quintet have recorded a brand new song, not released on any album thus far, and are now offering it for free in exchange for your email address to sign up for their mailing list. It's a fair trade indeed. The new track is a romantic and fun trip down memory lane, with appropriate 80s pop influences. Grab it for free at this link! And Happy Valentine's Day! February 14, 2015 - Nashville, TN - This Valentine's Day, Word Entertainment Recording Artist Family Force 5 is sharing the love by giving away a brand new song all weekend long. 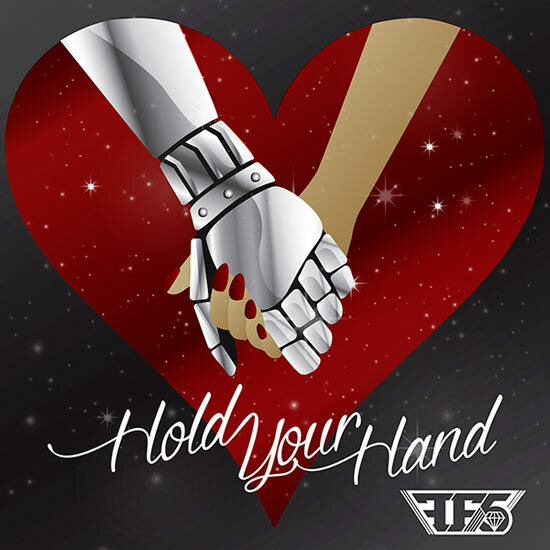 Beginning Saturday, February 14th, "Hold Your Hand" will be available as a free download through the Family Force 5 website. Fans can visit here for the duration of the Valentine weekend to access the free song, after which it will be available on iTunes. Historically a fan-centric band, Family Force 5 has also been inviting fans to email them at showlove@familyforce5.com for a special Valentine's Day surprise. Yesterday, the first 200 of the fans who responded received a hand-signed Valentine's Day Card from the band with special instructions for downloading "Hold Your Hand" on Friday, February 13th, one day before the general public. As an additional homage to their fans and "vinners," Family Force 5 is urging fans to tune in for what has become an annual tradition--watching the Valentine's Day edition of the "Really Real Show," which can be seen here.